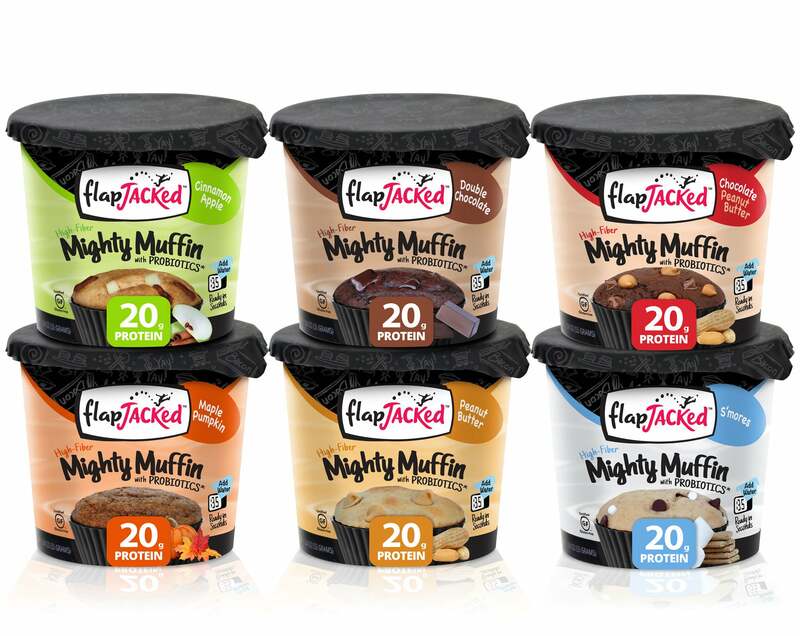 FlapJacked Mighty Muffins are delicious, gluten-free, protein-packed and high-ﬁber muffins developed with scrumptious ﬂavor, balanced nutrition and convenience in mind. Bursting with pockets of ﬂavor in every bite, Mighty Muffins pack 20 grams of protein and 220 calories in each serving (1 container). We've even added the beneﬁt of GanedenBC30 probiotics to help you support immune health as part of a balanced diet and healthy lifestyle. Just add water, microwave for 35-55 seconds and you have a delicious meal or snack on the go. This Peanut Butter Mighty Muffin is a peanut butter lovers dream. Made with roasted Virginia peanuts, hearty gluten-free oats and real peanut butter chips that will melt into creamy goodness with every bite. We’ve even added probiotics to help you support Immune Health as part of a balanced diet and healthy lifestyle. Just 230 calories, 20 grams of protein and 5 grams of fiber in each serving (1 container). This pack includes 12 cups. Your chocolate cravings are about to be satisfied! Not too sweet, this Double Chocolate Mighty Muffin is the ultimate dark chocolate treat. We use hearty gluten-free oats, natural cocoa powder, and chunks of pure bittersweet chocolate that will melt in your mouth with every bite. We’ve even added probiotics to help you support Immune Health as part of a balanced diet and healthy lifestyle. Just 220 calories, 20 grams of protein and 6 grams of fiber in each serving (1 container). This pack includes 12 cups. The Maple Pumpkin Mighty Muffin is distinctive and delicious. We use hearty gluten-free oats, real pumpkin, aromatic spices and top it off with sweet maple morsels that melt in your mouth with every bite. We’ve even added probiotics to help support Immune Health as part of a balanced diet and healthy lifestyle. Just 200 calories, 20 grams of protein, 6 grams of fiber and a good source of Iron in each serving (1 container). This pack includes 12 cups. This Cinnamon Apple Mighty Muffin is moist and decadent but not overly sweet. We use hearty gluten-free oats, real pieces of apple, and sweet cinnamon morsels in every bite. This muffin contains 1/2 teaspoon of Cinnamon in every serving to help lower cholesterol. We’ve even added probiotics to help support Immune Health as part of a balanced diet and healthy lifestyle. Just 220 calories, 20 grams of protein and 5 grams of fiber in each serving (1 container). This pack contains 12 cups. This S’more Mighty Muffin is sure to bring memories of campfires. Made with hearty gluten-free oats and molasses, the delicious milk chocolate bits and marshmallow drops melt into creamy goodness with every bite. We’ve even added probiotics to help you support Immune Health as part of a balanced diet and healthy lifestyle. Just 220 calories, 20 grams of protein and 5 grams of fiber in each serving (1 container). This pack includes 12 cups. This Chocolate Peanut Butter Mighty Muffin is the perfect combination of decadent, bittersweet chocolate with creamy peanut butter morsels that melt into creamy goodness in every bite. We use hearty gluten-free oats, pure dark chocolate, and sweet peanut butter chips. We’ve even added probiotics to help support Immune Health as part of a balanced diet and healthy lifestyle. Just 240 calories, 20 grams of protein and 5 grams of fiber in each serving (1 container). This pack contains 12 cups. 1. REMOVE sealed protective film. 2. ADD 1/4 cup cold water. 3. STIR using a fork until well blended. 4. MICROWAVE on high per cooking time based on your microwave wattage. 5. ENJOY! But caution, contents are hot!